I hope that you are having a wonderful weekend filled with pure awesomeness! Well, it’s finally here, the Holiday Season has arrived! So, it’s time that you got serious about your gift giving this year and give something truly memorable. With all posts, we always talk about that “box” of memories that you have stored in your attic or basement. Now it’s time to put on some gloves, grab a flashlight and find that box. It’s the treasure chest you always knew you had but never knew it was treasure! Instead of going to a store and picking out a few things, why not make this years “big gift” something that will truly be cherished! 1. 8/16mm film – we can transfer both formats for you and your loved ones to beautiful High Definition. We can put all of your old films onto DVD or, you can get the raw files that are native to Mac or PC (whichever you have) and YOU can do your own edits! 2. Photos, Slides, Negatives, and More – We can scan virtually ANYTHING that you bring into our stores! After that, we can make you prints, an awesome DVD slideshow, a Photobook (perfect for an awesome coffee table book), or we can give you the digital files on either a CD/DVD, thumb drive, or external hard drive. 3. Records, Cassette’s, 8-track, reel-to-reel – Have your old audio media transferred to a playable CD or mp3 files! 4. Do you have a photo that is damaged? No Problem! We can restore it to its former glory! 5. Cellphones, Laptops, Tablets – We can transfer all of you memories off of these types of media as well! As you can see, we can do it all! Leave A Legacy is your one-stop shop for all of your most cherished memories! As of writing this blog, there are only 8 days left to take advantage of our slide special! Bring in your slides for transfer and receive a free Silver Package Slideshow with your project! Hurry though, it only lasts through Nov. 30th, 2014! 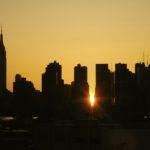 Manhattanhenge also referred as the Manhattan Solstice, is treated as a photographer’s delight. 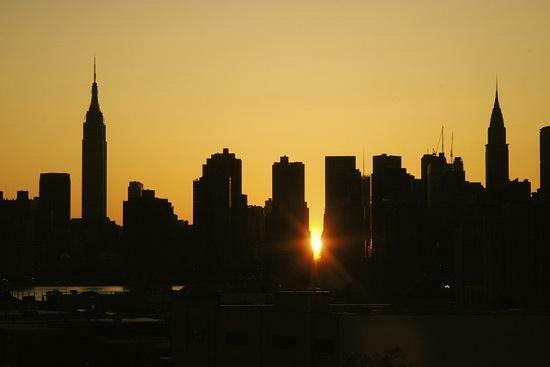 Occurring twice a year, during this circumstance, the setting sun aligns with the east–west streets of the main street grid in the borough of Manhattan in New York City. An amazing photographic opportunity is created during this when the tall buildings create a vertical channel to frame the setting Sun. Thanks you for reading, if you would like to leave a comment, please do so at the bottom as we would love to hear from you!